Hanging plants are some of the most adaptable. Planted in the garden, the plants grow up and over anything in their way, spreading out for many feet. When used as a hanging plant in a basket where the roots are constricted, the plants grow much smaller. Hang the plants outdoors when the conditions are right, and bring them indoors other times to enjoy the plants all year long. Ornamental sweet potato vine (Ipomoea spp.) is also known as Blackie sweet potato and Margarita sweet potato, and is a member of the morning glory family. Three varieties--Blackie, Tricolor and Margarita--are recommended for hanging plants. The vine has lobed leaves and large flowers that resemble a morning glory. Blackie has dark purple, almost black, leaves; Margarita has chartreuse leaves, and Tricolor features pale green and white leaves with pink margins. The plant is a native of the tropical regions of Central and South America and grows in full sun to full shade and a soil that is constantly moist. Japanese creeper (Parthenocissus tricuspidata) is also known as Boston ivy. The plant is a native of Japan and Central China. The ivy grows from 30 to 50 feet long with lobed deciduous leaves that measure from 4 to 8 inches wide and turn reddish-purple in the fall. The green-white flowers bloom in June, growing in clusters. The flowers are followed by blue fruit that ripens in September and is a favorite of the bird population. Japanese creeper does well in full sun to full shade, and needs a moist soil. 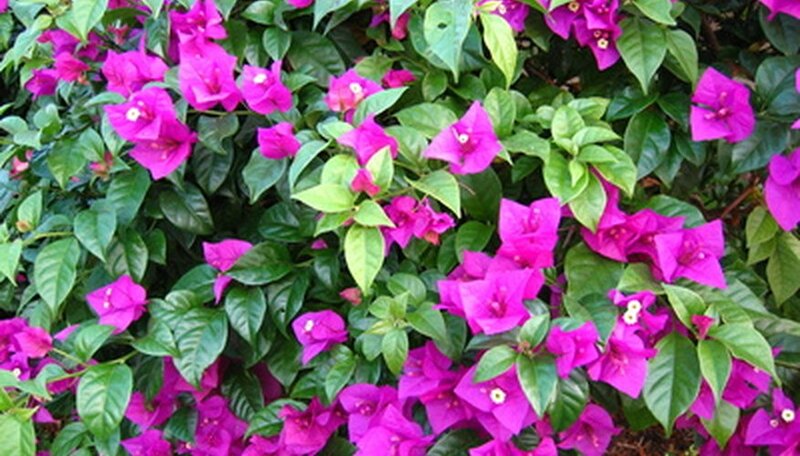 Bougainvillea (Bougainvillea spp) is also known as the paper flower and is a member of the four-o'clock family. The plant is a semi-evergreen vine that grows up to 30 feet long with green heart-shaped leaves that measure 3 to 5 inches long. The small white flowers are surrounded by deep lavender bracts--the petal-like covers of the flower buds--that measure 1 to 3 inches across and bloom in the summer and the fall. The plant is native to South America and likes rich, moist soils and bright sun. Sword fern (Nephrolepis exaltata) is also known as Boston fern and wild Boston fern. The plant produces fronds that grow up to 3 feet long and 6 inches wide and are made up of 3-inch-long leaflets. The plant is native to Florida, South America, Mexico, Central America, the West Indies, Polynesia and Africa. Outside, sword fern needs partial to full sun. Indoors, bright filtered light. Give the plant a soil that is moist but not wet. Sword fern likes high humidity and does well in the kitchen or bathroom.